The new TC-2 update is here! This update contains the new Self Learning TC algorithm you have heard others raving about in the Profiler System. This update should provide to be much more consistent corrections throughout the RPM range, as well as better overall slip detection, while limiting false corrections. The Mode setting may be different with the new firmware, a good starting point is 5. 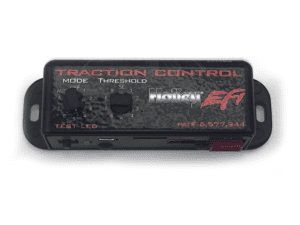 The non-Self Learning mode (Threshold knob) built into the TC-2 is also greatly improved and may be useful in some conditions, such as extremely bumpy surfaces, or when not doing a standing start drag race. The Threshold setting may be different with the new firmware, a good starting point is 5. The non-Self Learning mode is activated by setting the Threshold knob to a value other that SL, such as 1-8. We highly recommend this update for EVERYONE! No need to call to see if you should update- the answer is YES!